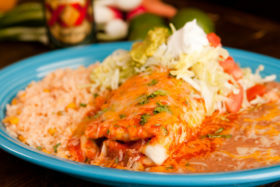 Two baked or fried flour tortillas, smothered in white melted cheese, garnished with lettuce, sour cream & diced tomatoes. Served with rice and refried beans on the side. Deep-fried and rolled corn tortillas ‘flaute style.” Served with rice and refried beans on the side.